Columbia Heather Canyon™ Electric are probably the most stunning boots you will ever see. 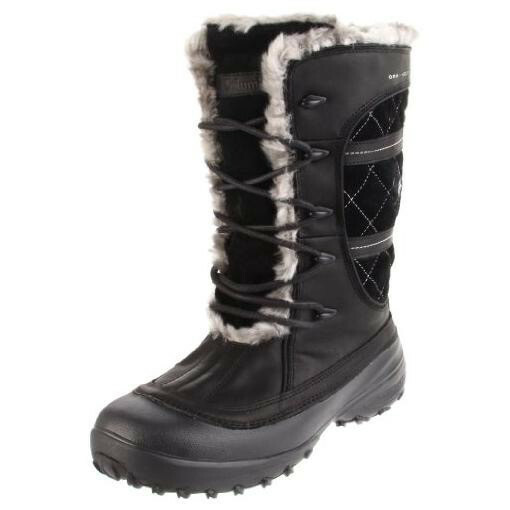 These boots will keep your feet warm and cozy in the worst and harshest winter conditions. Columbia makes very durable and long lasting boots that are loaded with lots of comfort but these boots cross the boundaries of the comfort by miles. These boots have the upper made from the suede and leather and it is waterproof. The upper has the special insulation from inside with the Omni-Heat® insulation and it also has the thermal reflective interior. These insulations maintain warm and cozy wearing the freezing weather conditions by blocking the chilly weather to penetrate from the outside and trapping the body heat inside. The upper has the waterproof membrane which provides breathability at the same time. There is a push button on the top which has the designer’s logo on it. This push buttons starts the electronic unit which keeps your feet maximum warm. This unit has the built in rechargeable batteries and it also features three settings for temperature control. The lowest setting will keep your feet warm for up to 8 straight hours while and the highest setting will drain the battery in 3 hours. The midsole and shell have been made from the Techlite® which is lightweight and shocks absorbing material. The footbed is made from the EVA which is also shocks absorbing material and it is wrapped with the nylex. This footbed keeps your feet in complete comfort throughout the day by minimizing the stress and fatigue. The shank is made from the nylon to offer your superb arch support and torsional rigidity. The upper has the collar lined with the faux fur which has the quilted construction. This collar provides softness and it prevents the heat from escaping. The pull on tab at the heel allows you to wear these boots more easily. The upper also has the metal hook and durable laces on the top which allow you to get secure and snug fit every time. The outsole has been made from the Omni-Grip® rubber compound which is super durable and long lasting. This outsole offer unbelievable traction on all types of surface. The lugs on the outsole have specially been designed for the winter conditions to give you grip on the snow and other slippery surfaces. Its heel is 1 ½ inches high with 1 inch high platform. Its shaft is 10 inches high with 17 inches of circumference. These boots weighs 1 pound and 6 ounces. You can find this style in these colors: Black.